You might have seen the lot of tablets on the sidelines. Microsoft Surfaces in not only coaches but also players hands. That is how the teams are reviewing plays – getting away from the printouts. 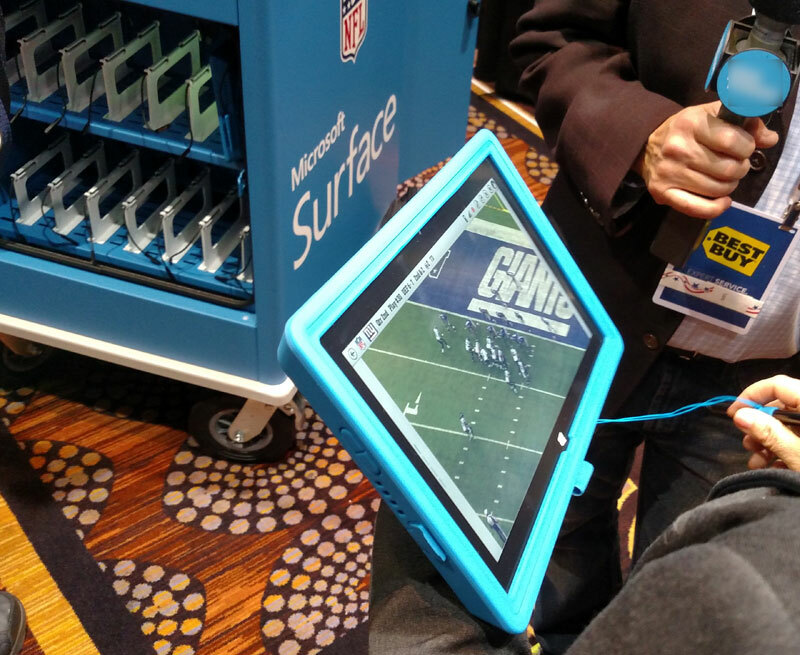 I talked with Beth at CES Unveiled about how Microsoft Surface was being used. They have created a cart system that allows the surface devices to be stored and charged along with kept cool or warm in extreme temperatures. The cases are built to be waterproof and can take a beating if a Quarterback or coach didn’t like the plays on the screen. A hand strap is on the bottom for ease of use and when returned to the cart, they connect to the charger to stay at 100%. The system takes two stills – before the play and after – to show what happened and maybe where communication broke down or worked perfectly. Each person can annotate the frame so plays can be discussed or new plays can be created. By using the tablets the information can be sent a lot faster than paper copies could be printed out. It also doesn’t make a mess as all screenshots are on the tablet and can be chosen by a swipe and click. I asked Pro 2 instead of Pro 3 – Beth stated since the technology has to be available equally for both teams, the development started with Pro 2. Eventually the system would upgrade but for now the 2nd generation Surface will do just fine.